On this day in 1986 Motley Crue member Vince Neil entered jail to serve his 30-day sentence for vehicular homicide. 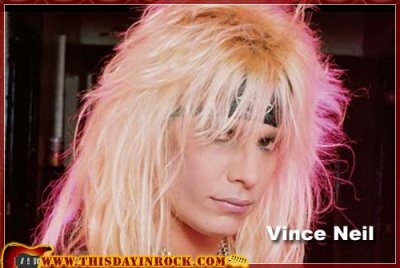 On December 8, 1984 drummer Nicholas “Razzle” Dingley of the Finnish hard rock band Hanoi Rocks – in town on their first American tour – visited Vince Neil’s home in Redondo Beach. After hours of partying together the two rockers decided to make a run to a local liquor store. A drunk Vince Neil was behind the wheel when he lost control and collided with a car going the opposite direction. The two people in the other car were seriously injured, and Nicholas Dingley was killed. Vince Neil was charged with driving under the influence of alcohol and vehicular manslaughter. At the time of the crash, Vince Neil’s blood alcohol level registered at .17 – more than twice the California legal limit of .08. In July 1986, Judge Edward Hinz, Jr. of the Los Angeles County Superior Court sentenced Neil to 30 day behind bars, five years probation, 200 hours of community service, and $2.6 million in restitution to the crash victims. After 15 days in jail, Vince Neil was released for good behavior. Motley Crue’s third studio album, “Theatre of Pain” was dedicated to Nicholas Dingley. What? 30 days for having someone killed? he was released after 15 days? don’t you get a night in prison for simply chewing gum in court? 53 queries in 1.463 seconds.